Liver cirrhosis is a very common chronic disease and one of the leading causes of death in Europe. Cirrhosis has a marked impact in patients quality of life and represents a major burden for health systems. Figure 1: Potential beneficial effects of simvastatin and rifaximin in cirrhosis. Treatment of cirrhosis is currently based on symptomatic management of complications and has not changed substantially in the last 20 years. There is an unmet need for therapies that target the pathobiology of cirrhosis. 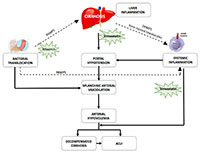 The objective of LIVERHOPE project is to evaluate a novel therapeutic strategy for patients with cirrhosis based on a combination of rifaximin and simvastatin, targeting the main pathophysiological mechanisms of disease progression, namely the impairment in the gut-liver axis and the persistent hepatic and systemic inflammatory response (see Figs. 1 and 2). Figure 2. 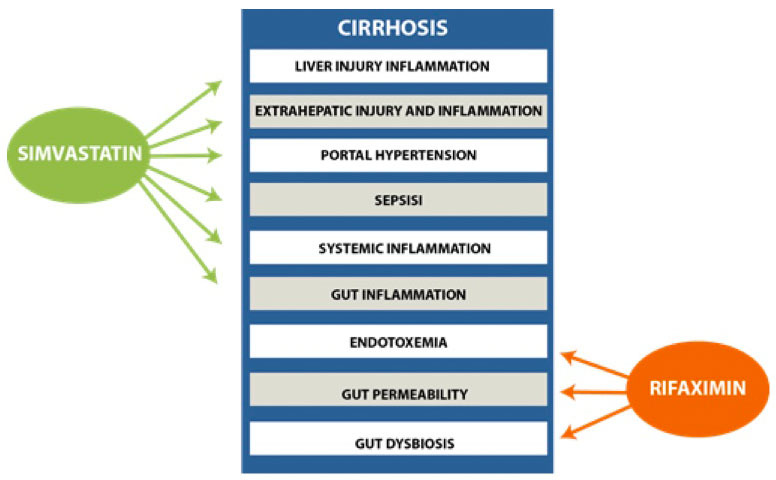 Pathobiology of cirrhosis progression. 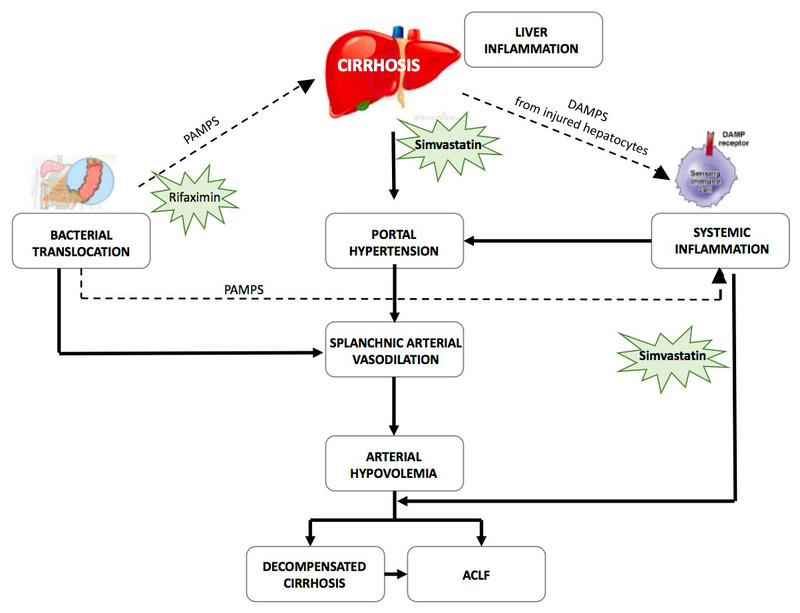 Alterations in gut–liver axis and hepatic and systemic inflammation in cirrhosis interact and promote their effects on portal hypertension and drive cirrhosis progression and development. The impairment in the gut liver-axis will be targeted with the use of rifaximin, a non-systemic antibiotic that decreases the gut permeability, reducing systemic endotoxin levels characteristics of cirrhosis, modulating the intestinal microbiome. The inflammatory reaction will be targeted with the use of simvastatin, a drug of the statin family that decreases systemic and hepatic inflammation, improves the altered hepatic microcirculation, decreases portal hypertension and reduces fibrosis progression. We will perform two randomized clinical studies to investigate safety, tolerability and efficacy of combination of simvastatin plus rifaximin in patients with decompensated cirrhosis in in France, Italy, Germany, Spain and United Kingdom. The main objectives of the LIVERHOPE project is to improve patients quality-of-life and to increase survival of patients. Within LIVERHOPE we will also investigate biomarkers of response to treatment and disease progression that can be useful in clinical practice for improving the treatment of patients. The expected impact is to halt progression to acute-on-chronic liver failure, the main cause of death, to decrease complications of the disease, to reduce hospital readmissions and to improve cost-effectiveness of therapy. We will invest our effort also in communication and dissemination of project progresses to patients, common people and policy makers for increasing awareness about chronic liver diseases in so that preventive measures can be established to decrease the burden of cirrhosis and to reduce social stigmatization of patients with chronic liver diseases.